Our market stand this week, or: "hey, it's not just radishes!" It’s really terribly exciting to have more coming out of the ground than just radishes, which had been the trend for the last two weeks. In addition to more produce, we also had 400% more customers than last week! 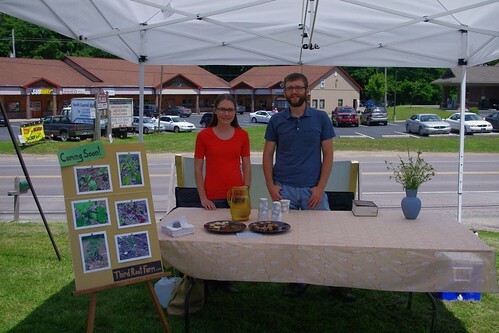 We sold through about 75% of what we had by 10:30am, and by the end of the day we were left with just a few bunches of herbs. As the market runs until 1pm, we did a lot of explaining to people: “No, there’s more! Come back next week!” Chalk it up to the market having an ad in the paper this week. The last “more” of the week is more newspaper men. Having started with zero of them in previous weeks and zooming up to one this week, they are making up a larger percentage of our customers than ever before. And the market will hopefully be making up more of said newspaper man’s articles, but we’ll have to wait a few more days to see. The slightly-rhyming Rick Hiduck (whose name promptly lodged itself in my head for the rest of the day) of the Rocket Courier came out to see what was up and talk to some of the vendors. And, of course we’ve got the weekly recipe! These quick refrigerator pickles are easy to make. Our family couldn’t tell that they weren’t cucumbers at a recent cookout. Toss the zucchini and salt together in a colander and place over a bowl to catch the liquid. Cover and let stand one to two hours. Toss once along the way. Lightly squeeze excess water from zucchini and pat dry. Pack into a pint size jar along with the dill and garlic. Combine the vinegar and sugar in a small saucepan over medium heat. Bring to a simmer and boil until sugar dissolves. Pour the liquid over the zucchini, seal the jar and let cool. Place in the refrigerator. The pickles will keep for about one week. 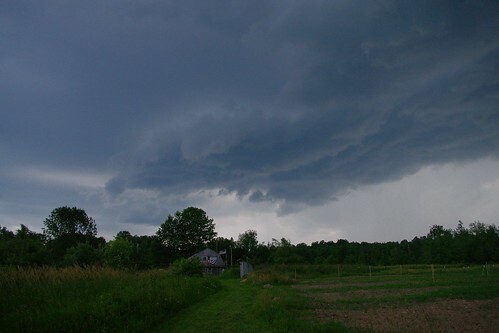 We’ll leave you this week with some storm clouds moving in on the farm. Allie took this one a while ago, but we haven’t had a great place to reference it yet. Not that right now is all that much better, but hey, it’s your second photo of the post. If you are curious about the conspicuous lack of post last week, Allie was out in Seattle with her sister (whose great cooking blog I’ll plug: Tessa’s International Cafe). Nick may or may not have taken this as an opportunity to slack on the blog a bit. 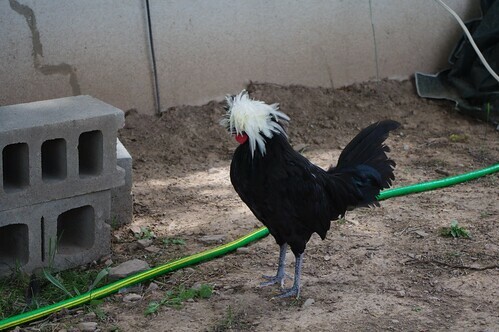 I know I promised you chickens last time, and you’ll get them tomorrow. 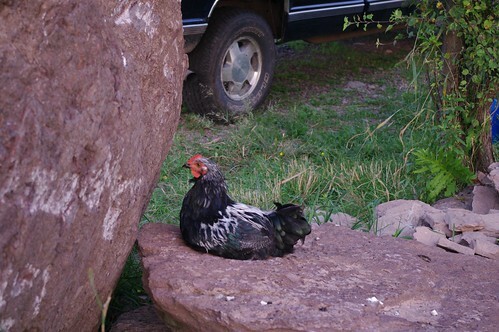 Going to be another scorcher, so I’ll finish up the chicken post while we take the afternoon off. 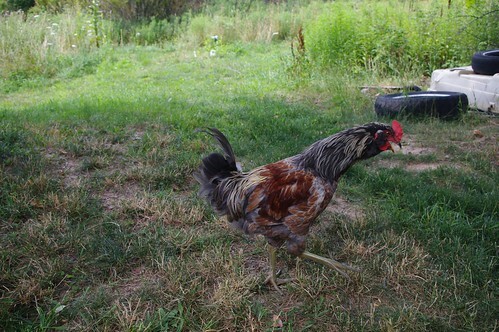 In the meantime, you can check out the new chicken pictures on our Flickr stream. We made it through week two at the farmer’s market today. And we even had produce! Radishes, to be exact. 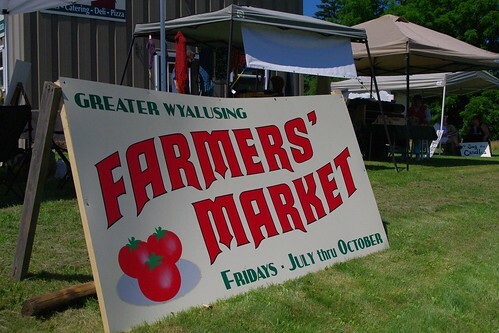 The location got moved this week to the American Legion on Route 6 in Wyalusing. It’s a great spot, and hopefully we stay stable so folks can keep coming back. We’ll probably do a longer post about it in the future, but the pre-market ritual is interesting. Today we were up at 6am to get outside, pluck some produce, wash it, group it, and pack it up. 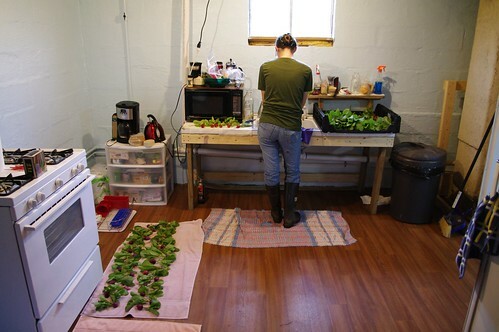 As we progress to having more than just radishes, we’ll need to start working the night before. Good thing the kitchen is progressing, as you can see in the picture below. For the last two months, we’ve just had a mini fridge, microwave, and electric kettle. Now, we’ve got a full sized fridge and a gas stove. Sometimes it’s the simple things in life . . . Serves 4-6. Originally from Rachel Ray. Cover the potatoes with cold water. Salt the water and bring to a boil. Boil the potatoes until just tender, 12-15 minutes. Drain. Meanwhile, combine the honey, Dijon mustard, and vinegar in a bowl, then slowly whisk in the olive oil. Season with salt and pepper. To the bowl add the radishes, capers, onion, celery, parsley and hot potatoes. Using a wooden spoon, break up the potatoes into large chunks. Toss the potato salad, adjust the salt & pepper, then serve. That about wraps it up for this week. 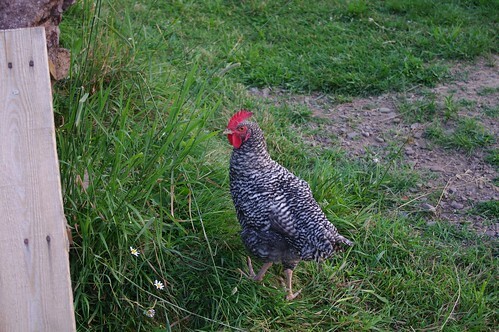 Coming up: chicken news. It’s like a reality TV show . . . someone gets exiled and has to spend the night outside. You may recall a few posts ago, when we were struggling with what to do about the grass that kept popping up, little terrorist sleeper cells in our battle for agricultural freedom </hyperbole>. Well, we’re hoping part of the answer will be mulch. 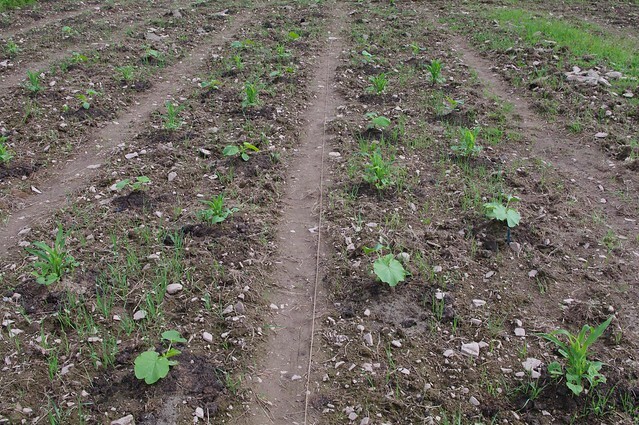 In the photo above, you can see straw laid out over some of the melons. 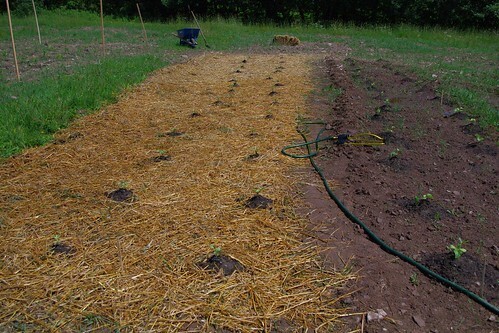 One row is just straw, another is straw and wet newspaper, and another is no mulch at all. It’s a little experiment to see what works best, tho we admit our control group is a little non-existent since each row is also a different type of melon. 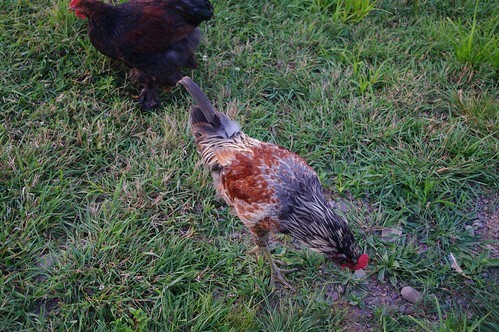 We’re also trying grass clippings as a mulch. 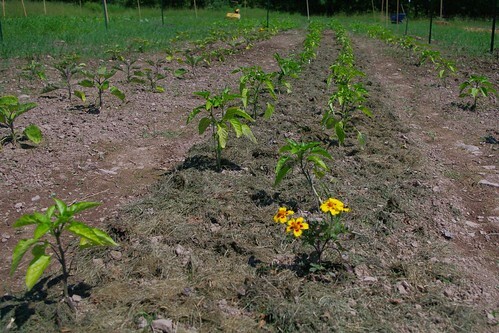 In the pic above, you can see it in action on the pepper plants. 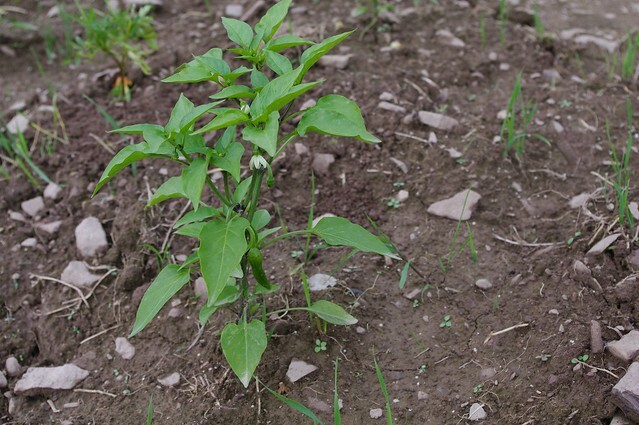 Besides keeping weeds out and moisture in, we’re also curious to see if any residual nutrients in the grass clippings will leech down to the peppers. If you’ve got mulching experience and have any sage words of wisdom, feel free to comment! There it is. 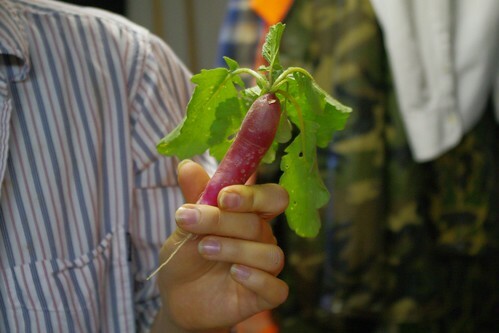 The very first thing we’ve made (with a solid assist from soil and water) — a French breakfast radish. 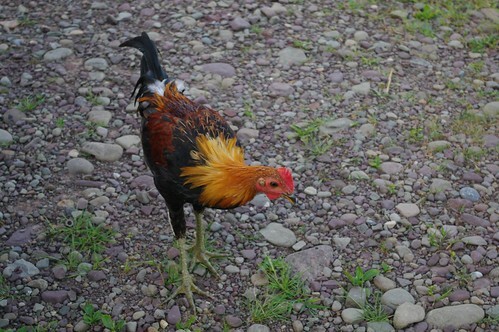 Little bugger was delicious, albeit a little spicy to eat straight up. It’s purple and red globe brethren were equally delicious. 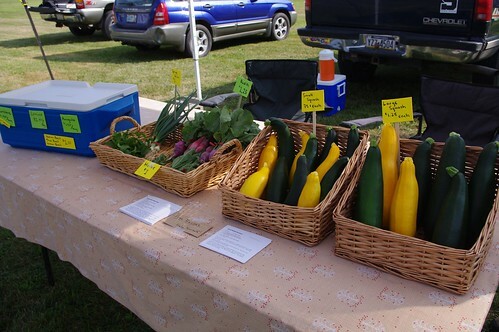 We’ll actually have produce to sell this week! 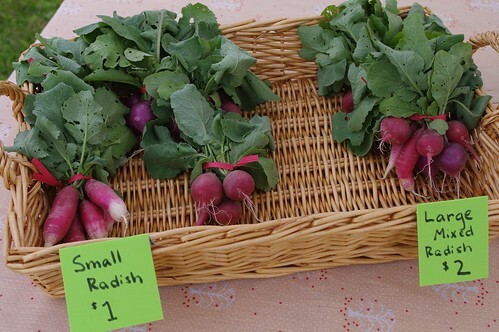 We’ll try selling two types of bunches: smaller, sweeter radishes and larger, spicier ones.